Through the years, Youth baseball has gotten consistently more competitive; and high stakes. Due in large part to professional teams scouting younger and younger, the demand for foundational skills that lead to pro-level play is higher than ever. The level of baseball in the country’s top youth leagues are improving to the point that kids not trained for elite skills simply cannot compete. Parents and coaches strive for the best baseball experience for their kids, but instructional resources are so scattered, and schools of thought so varied, that nothing short of a detailed nationwide search will separate the elite coaching tips from the rudimentary (and even detrimental )ones. But now, a groundbreaking new resource is available to ensure high-quality, elite play for your specific league, team and child. The Coach’s Companion: Winning Baseball for Beginner to Intermediate is the first volume of a new series by Trent Mongero; a breakout multi-media resource that boasts the most complete and comprehensive coaching /drilling guide for youth baseball at any level. With a powerful visual component—a live-action demo DVD—Mongero’s Companion is unmatched in high-quality, elite baseball instruction for youth. Coach’s Companion is “no frills, no fluff,” just pure pro-level knowledge that coaches, parents and players can implement in their practice regimens immediately. Literally packed with content, Coach’s Companion contains not only the highest number of quality tips per volume than all other coaching guides on the market, it has the most number of illustrations, and is the only guide with an accompanying DVD containing over four hours of demonstrations; allowing players and coaches implement every skill immediately. With its comprehensive hitting, fielding, and pitching program, Coach’s Companion builds the foundations for a winning baseball experience, providing the tools for young players to excel now and/or prepare for the college or pro level. Two days ago, we had the 2011 Opening Day parade for my son’s Little League. Last season, both my son and daughter played Little League ball – she was in Girl’s Rookie/Coach Pitch and he was T-Ball in the Spring and then Rookie/Coach Pitch Baseball later in the Fall. It was their first year of Little League. In 2010, I was able to help out with both of their teams in an unofficial capacity – assisting when needed at practices and coaching the bases during Fall Ball. This season, only my son is playing Little League – again in Rookie/Coach pitch. (He’s seven years old now.) And, I am officially a coach on his team this season - having attended all the clinics and certification classes that our league requires. Trent Mongero was a switch hitting shortstop at the University of North Carolina at Wilmington (Division I). While there, in 1989, he was voted the CAA “All-Conference” shortstop and “Conference Player of the Year.” After college, he played a season in the Atlanta Braves farm system. Since then, Trent has been coaching high school baseball for over 19 years and currently is the head coach at North Hall High School in Gainesville, Georgia. Mongero is also currently an associate scout for the Atlanta Braves. In addition to his high school coaching duties, in 2001, he was co-head coach of the American Legion Post 10 squad that played for the North Carolina State Championship. Also in the summer of 2001, Trent was part of the Wilmington Sharks coaching staff. (The Sharks play in the Coastal Plains League which is a summer league consisting of many top college players in the country.) When Mongero was there in 2001, the Sharks won the CPL Championship. Trent also instructs at some of the top college baseball camps – including the University of South Carolina, the USA National Team and the University of Mississippi (Ole Miss). Mongero has coached many players – including 12 athletes who have signed professionally and more than 80 student-athletes who have furthered their baseball careers at the collegiate level. Within “Minimum Skill Expectations” there are chapters for “T-Ball” (Ages 4-6), “Coach or Machine Pitch” (Ages 7-8), and “Player Pitch” baseball (Ages 9-10). In each chapter, Mongero details the fundamental offensive and defensive skills for that level as well as providing information on the mechanics that should be covered for that age group. He also covers how to coach game skills at each level. I found the information in each of these chapters to be top-notch and extremely useful. And, while the chapters included many excellent color photos that aid the learning experience, this is a good spot to note that Winning Baseball: For Beginner to Intermediate Play is not just a “How To” soft-cover manual. Along with the book comes a 4-hour instructional DVD. Between the text and photos in for each instructional item, and the companion DVD, is everything you need to know about teaching kids ages four to ten proper baseball skills appropriate for their age. However, on top of that, within “Outside The Lines” there are chapters on eliminating bad habits and keeping the game fun as well as highlighting common hitting and pitching flaws (and how to correct them). Also within this section is a chapter on “The State of Youth Baseball” that I feel is a must read for anyone coaching kids baseball when it comes to dealing with the players and their parents. In “Prepare To Coach,” Mongero covers coaching qualifications and a guide to run a baseball practice. And, in “Travel and All-Star Teams,” he covers everything associated to putting together such a team – in terms of coaching, budgets, fundraising, procedures, etc. When you factor everything that is covered in Trent Mongero’s Winning Baseball: For Beginner to Intermediate Play, and the quality of the information therein, and how it is supported with excellent photos and instructional DVD, I highly recommend this book to everyone who is involved in coaching youth baseball. In addition, I feel that anyone who has a child playing youth baseball would benefit greatly from this product as well. Lastly, if you’re a baseball fan, regardless if you have any interest in youth baseball, Coach Mongero's book/DVD combination may interest you. As a baseball fan, how many times have you heard about a pitcher “pushing the ball” or “jumping out at the plate”? Or, how many times have you heard about a batter “not loading” or “not staying inside the baseball”? When hearing things like this, do you really know what they mean? If you read Winning Baseball: For Beginner to Intermediate Play you will know what they mean – because those types of matters are no different at the big league level than they are at the youth level. Lastly, to get a taste of what the Winning Baseball: For Beginner to Intermediate Play DVD (which is included with this wonderful book) is like, check out Mongero’s YouTube channel. I’ve been getting more requests from publishers and publicists to review books, so I’ll be posting “Book Brief” as often as I can. I can’t always write full reviews for every book I receive, but I’d like to pass information on to our readers and let people know about books I’m looking at, especially because some of them are from small presses or aren’t being reviewed in larger publications. 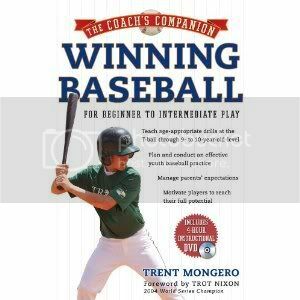 Coach’s Companion: Winning Baseball by Trent Mongero is for coaches and parents who want to teach kids how to play baseball. I am helping coach my son’s little league team for the second time and was familar with some (but certainly not all) of the techniques and drills the book contains. It seems like a good resource for someone who wants to learn about coaching baseball. I showed the book to our team’s head coach, who has way more experience at this than I do (he coaches high school football as well), and he was impressed with it. He’s familar with other books in the field, and said that Coach’s Companion was superior to some others he’s seen. He noted that not all instructional guides have color photos, and liked that the book showed more than one angle on pitching grips. Coach’s Companion also comes with an instructional DVD. Click on the cover of Book 1 (above) to purchase your personalized copy! Help your child or team get better today!